The Food Alphabet and More: O Wow! Oishi! O, Wow! An invitation got delivered to my doorstep! And all I could say was O, Wow! A large box 6 feet high was at my midst. As the box says, Open up for a surprise! O, Wow! A box full of my Oishi favorites, new favorites and more! I remember the good old childhood days, where I munch on my favorite Oishi treats, such as the Oishi prawn crackers and Kirei flakes, ah a dream come true indeed. Oishi, the name that has been a household name for fun snacks to people from all walks of life for more than three decades, gives a new approach on how Oishi has evolved through the years, and made us fall in love with their wide array of products with a new catchy campaign together with one of the country’s most promising TV personalities. 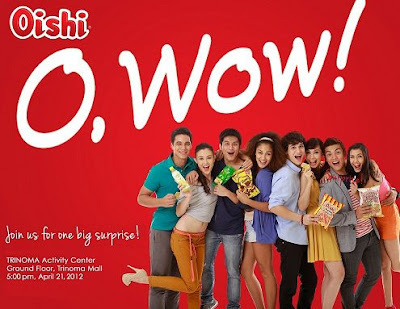 The Oishi ‘O, Wow!’ campaign is starting a joyful trend especially among the young and fun loving individuals. And what better way for Oishi to resonate this branding campaign than with the young and talented Elmo Magalona. And with Elmo at the forefront of the ‘O, Wow!’ movement, more and more people will surely get into the Oishi bandwagon and experience a different kind of high with every pouch of high quality Oishi products. This is only the beginning. Join us for one big surprise on Saturday, April 21, 2012 at 5:00 PM, Trinoma Activity Center.